They are really cracking on with this house. Bear in mind these are not ready made joists. These are proper made on site jobs. 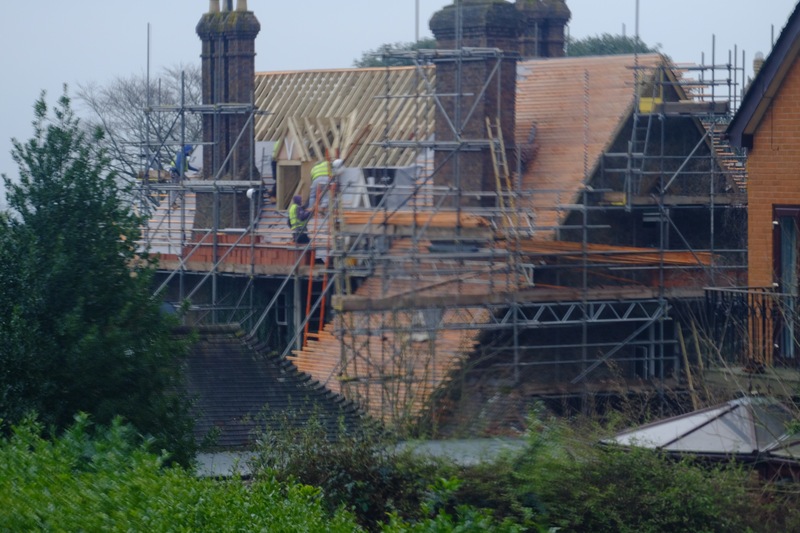 If you look very closely you can see the little terracotta tiles ready to go on the roof. They saved some but I know a lot got broken when the roof was on fire. Did a bit of housework this morning. Things must be bad. Went to see some friends for lunch and company. Actually a better day but that has its downside because then you get a pang of guilt for not feeling… what exactly? Feeling sad, miserable, lost and lonely? Well you still are, don’t kid yourself. It will be a long time. Its something you have to learn to live with, rather like the devil that caused my unhappiness in the first place. But we managed then and we will manage now, me and my soldier. So glad you have a buddy with you at all times. Adrian really took care of you.